Structure of Cell [Part 2] ~ Pass. Science. Solutions. Ribosome : The ribosomes were first reported in plant cells by Robinson and Brown (1953) and Palage (1995). They observed itin animal cell, usually attached to the outer surface of endoplasmic reticulum. The name ribosome was proposed by Haguenau (1958). It is a minute rounded ribonucleoprotein structure, consisting of RNA and proteins. the ribosome contains two unequal subunits and these subunits remain attahed together by means of binding force of magnesium atom. The larger subunit has dome like shape, while the smaller subunit occurs above the larger subunit as a cap like structure. Occurence: The ribosomes occur in both prokaryotic and eukaryotic cells. In prokaryotic cell, it is found freely in cytoplasm. In eukaryotic cell, it is found freely in cytoplasm, matrix of chloroplasts, mitochondria or remains attached to the endoplasmic reticulum. 1) 70s ribosomes: These are comparatively smaller in size and have sedimentation coefficient 70s. They consist of two subunits, a large 50s subunit and a small 30s subunit. They are found in the prokaryotic cells of bacteria and blue green algae. They are also found in the chloroplast and mitochondria of eukaryotic cell. 2) 80s ribosomes: These are comparatively larger in size and have sedimentation coefficient 80s. They consist of two subunits: a large 60s subunit and a small 40s subunit. the 80s ribosomes are found in cytoplasm of eukaryotic cells. Ribosome is the main site of protein synthesis and hence, it is also called the protein factory of the cell. 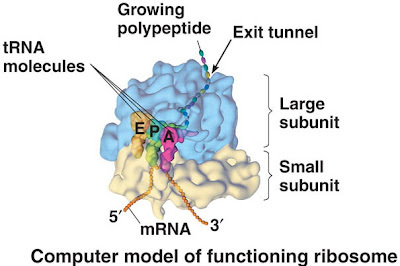 during protein synthesis many ribosomes are aggregated due to common messenger RNA and form the polyribosomes. 1) All the cisternae are slightly curved so as to give a concave and convex face. 2) Tubules arise from the peripheral area of cisternae to form a flat network. 3) Vesicles: These are small flattened, oval, round or irregular sacs, attached to tubules. 4) Vacuoles: These are numerous, large, spacious, round sac-like or irregular structure. They are generally found at the distal end of cisternae. 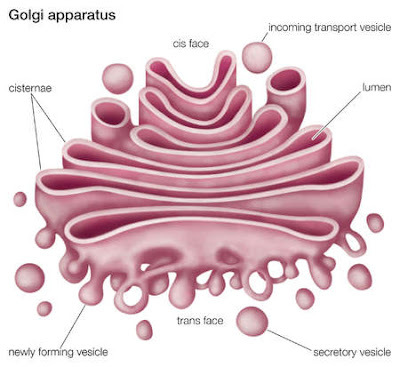 1) The golgi complex forms secretory vesicles, which moves to the surface of the cell and discharge the secretory molecules outside the cell. 2) The membranes of secretory vesicles gets incorporated into plasma membrane after discharging their contents. Thus, the size of membrane gradually increases. 3) It stores certain proteins and lipids. 4) During the cell division in plant Golgi bodies form a cell plate at the centre of dividing cell. 5) The cell wall material such as pectin, hemicellulose and microfibrils of alpha-cellulose are synthesized by Golgi bodies. Thus, it also helps in cell wall formation in plant cell. 6) In endocrine cells, it plays a key role in the secretion of hormones. 7) Golgi Complex forms primary lysosome. Lysosomes were first of all observed by Christian De duve in 1955. The lysosomes [Gr; lyso: digestive; soma: body] are tiny vesicles. They are bounded by a single membrane. They are found in most animal cells and only in a few plant cells like yeast, fungi and in green unicellular organisms. They are absent in bacteria and mature mammalian erythrocytes. The lysosomes are originated from endoplasmic reticulum or from the vesicles of the golgi complex. They contain some 40 kinds of enzymes and involved in intracellular digestion. the enzyme includes proteases for protein digestion, nucleases, glycosidases for digestion of polysaccharides, lipases, phosphatases i.e. phosphate linked compounds and sulphatases i.e. sulphate linked compounds. 1) Primary lysosome: These are newly formed small bodies. they contain enzymes in inactive state. 2) Secondary lysosome: The primary lysosome fuses with the vacuoles containing extracellular or intracellular substances and form secondary lysosome. 3) Residual body: The lysosome with undigested bodies are called residual bodies. 4) Autophagic vacuole: Lysosomes are able to digest cell organelles. Such lysosomes are called autophagic lysosomes. 1)Lysosome digests the particles that enter the cell like food particles. 2) In certain pathological conditions, the lysosomes start to digest the various cell organelles and cause ultimately the death of the cells. This process is known as autolysis or cellular autophagy. Therefore, the lysosomes are also known as suicidal bags. 3) The lysosomes digest disease causing micro organisms. 4)They also digest worn-out and the dead cells. 5) The lysosomes of sperms discharge their enzymes and digest the limiting membrane of the ovum at the time of fertilization. 1) At the time of cell division, the centriole get arranged on the two sides of the nucleus and form astral rays. 2) Centrioles give rise to basal bodies of cilia and flagella. Microsomes: There are minute particles of the cytoplasm. They possess RNA and small piece of endoplasmic reticulum. They help in protein synthesis. Lomasomes: Lomasomes were discovered by Moore and Mc Alear (1961). These are membranous or vesicular structures present between the cell wall and cell membrane. lomasomes perform the functions such as secretions, membrane proliferation, etc. A) Microfilaments: These are long, thin, very fine filaments of protein actin. they measure about 5-7 mm in diameter. They are abundant in eukaryotic cells just beneath the plasma membrane. 1) They play major role in cyclosis and amoeboid motion. 2) They bring about the cleavage of animal cells during cell division. 3) They help in muscle contractions. 4) They help in cell migration during embryonic development. B) Microtubules: Microtubules are long, hollow, cylindrical, unbranched tubules. They are 24-25 mm in diameter. The wall of microtubule is made of protein tubulin. They are found in all eukaryotic cells except human erythrocytes. 1) They form structural framework of cell and maintain the shape of cell. 2) They help in sliding motion of chromosomes during cell division. 3) They help in intracellular transport of materials. 4) They involved in cellular motility. 5) They help in movement of cell organelles within cell. 6) they form the skeleton of cilia and flagella. They also help in their beating movements. 1) Microfilaments are long, solid, cylindrical rods whereas microtubules are long, hollow, cylindrical tubules. 2) Microfilaments measure 5-7 nm in diameter whereas Microtubules measure 24-25 nm in diameter. 3) Microfilaments are made up of protein actin whereas Microtubules are made up of protein tubulin. 4) Microfilaments are found just beneath the plasma membrane whereas microtubules are found in deeper regions of the cell. Microbodies: The term microbody was used by rhodin in 1954 to uni-membrane bounded organelles, ranging from 0.2 to 1 millimicron in size. Lazarow and Fujiki (1985) identified four types of microbodies: peroxisomes, glyoxysomes, glycosome, hydrogenosome. Singular of Mitochondria is Mitochondrion. Mitochondria were first of all identified by Kolliker (1880) in muscle cells of insects. Later on, Richard Altmann (1890) made systematic observations and named them as bioblast. The present name mitochondria was assigned by C. Benda (1897). Mitochondrion is a Greek word derived from mitos meaning filament and chondros meaning granules. Thus, the mitochondria are granular or filamentous cytoplasmic structure. They are also called th power house of cell as they release energy during aerobic respiration for the vital activities of cell. They are rod shaped, somewhat spherical, oval, globular, cylindrical or filamentous in shape. They are found in the cytoplasm of all plant and animal cells except the prokaryotic cell. The mitochondria are present in varying number. Some algal cells contain only one mitochondrion, while some cells contain more than a thousand mitochondria. 1) The mitochondria are the centres of respiratory activity and contain all the necessary enzymes. 2) Kreb's cycle takes place in the mitochondria during which food material is completely oxidiesd into CO2 and H2O. 3) The oxysomes lining the cisternae and inner membrane function as electron carriers or transporters of hydrogen during Kreb's cycle. 4) Mitochondria can also synthesize structural proteins due to the presence of DNA and RNA. 5) Mitochondria are self-replicating and they are passed on from cell to cell.